Amazon.com description: Product Description: Welcome to the Canon EOS 50D, Canon's newest fullfeatured-- yet compact and affordable--digital SLR camera. 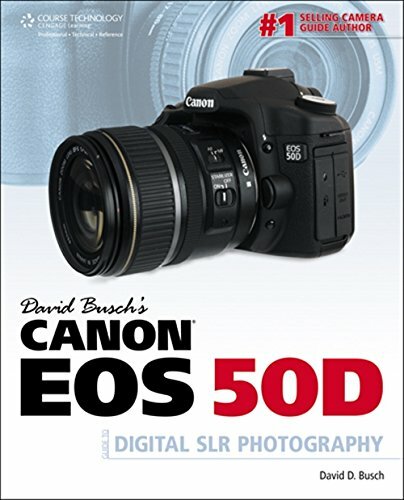 David Busch's Canon EOS 50D Guide to Digital SLR Photography shows you how to make the most of your camera's robust feature set, including 15 megapixel resolution, blazing fast automatic focus, and the Live View real-time preview system to take outstanding photos. You'll learn how, when, and, most importantly, why to use all the cool features and functions of your camera to take eye-popping photographs. Introductory chapters will help you get comfortable with the basics of your camera before you dive right into exploring creative ways to apply the Canon EOS 50D's exposure modes, focus controls, and electronic flash options. This book is chock full of hands-on tips for choosing lenses, flash units, and software products to use with your new camera. Beautiful, full-color images illustrate where the essential buttons and dials are, so you'll quickly learn how to use your Canon EOS 50D, and use it well. About: Welcome to the Canon EOS 50D, Canon's newest fullfeatured-- yet compact and affordable--digital SLR camera.